My good friend Simon at Data Ladder introduced you to big data and record linkage at the North Pole in his last musing. I was a bit hesitant at first when Santa asked me to write this article for Simon. It is our busiest time of the year and production is operating at maximum capacity, so it is hard to get away from the office. However, when I checked our database for Simon and the elves at Data Ladder, I found that they all hit our “NICE” category over 99.996% each year. So, it is hard to say no to such stellar performers as Simon and his elves. So, let’s talk about our big data at the North Pole and Santa Claus, Inc.
Santa Claus, Inc. delivers toys to 526,085,400 kids across the world on the night of December 24th. If you start to analyze the data, you will find that is approximately 22 million kids an hour, or 365,000 kids a minute, or 6,100 kids per second. Our factory staff operates at a productivity rate just over 178%. This allows us to have our entire product ready to ship by midnight on December 23th. 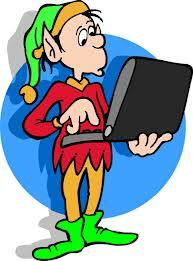 As the Chief Data Elf, I spend my time focused exclusively on accuracy of the data in the “Naughty or Nice” list. It is crucial that we have perfect accuracy in a database with 526,085,400 records. As you can imagine, our data entry elves make mistakes from time to time. Incorrect addresses, misspellings or wrong gender are some of the most typical errors. Of course, sometimes, the file is coded “NAUGHTY” when it should have been “NICE.” You can only imagine the disappointment this can cause on Christmas morning. That is where my team of elves swing into action! With the help of Data Ladder and Data Match 2012 we are able to provide Santa Claus, Inc., the most accurate data possible and produce a customer satisfaction rating of 100% year after year. Without the data elves and the help of Simon and Data Ladder, Christmas might not be as merry as we’d like it to be. So, if you’re looking for exceptional results from your data, download a free trial from Data Ladder today. May your holidays be merry and your data clean!